Coffs Harbour, 호주의 어씨텔 백팩커스 | 호스텔월드에서 예약하세요. Free WiFi, free surfboards, free canoes & surf kayaks, free stand-up paddle boards and heaps more! Purpose built hostel, centrally located with organized activities every day and night to make sure you have a stay to remember! Free pickup from the bus station between 7am and 10 pm. We are perfectly located in the lively Jetty area close to cafes, pubs, restaurants, shops and an international marina. The beach is just a 7 minute walk. With fabulous large communal areas and excellent facilities our clean, comfortable, fun, friendly hostel is well known for its great atmosphere; it's so easy to meet other people and have a good time. You can take our free surf kayaks down to the beach, use the free canoes to explore the beautiful Coffs Creek and then have fun with our bikes, free stand up paddle boards, free surfboards, free boogie boards and free fishing rods. Spot wild Koalas in the Botanic Gardens, just a 10 minute walk down the creek. Owned and operated by Gary and Cherie, we can help you organize any of the fabulous adventure activities Coffs Harbour has to offer. We will be happy to share our knowledge of the area and show you the Coffs Harbour that we know and love. Just some of the fun activities available are skydiving, scuba diving, surfing, horse riding, weekly trips to Emerald Beach, the Big Banana and the rainforest and whale watching (Seasonal). Join us for a great time! 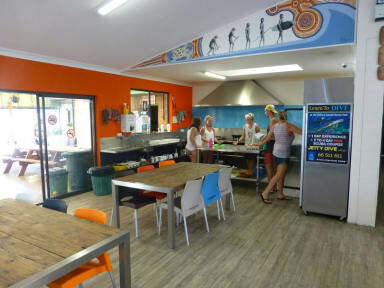 Aussitel Backpackers is purpose built with a swimming pool, hammocks and sun loungers, a pool table and excellent cooking and laundry facilities. We are well known for our friendly, fun atmosphere and have a brilliant range of planned social activities (one every day and night of the week) that will guarantee you a stay to remember! So come and join in the fun! Our office hours are 8.00am to 11.00pm. Arriving outside these hours please contact us for check in instructions.